In 1979, Chuck Berry released Rock It, his only album with Atco Records. Aside from live albums, the occasional compilation, and the soundtrack to the film Hail! Hail! Rock ‘n’ Roll, Rock It has held its position as the last, the most recent, Chuck Berry album ever since. Until today. Chuck Berry celebrated his 90th birthday today with a surprise announcement: he will release a new album of original songs next year. It is to be titled Chuck. His son, Charles Berry, Jr., and the musicians he has performed with for the last two decades at his nightclub, Blueberry Hill, are his backing band on the new album. 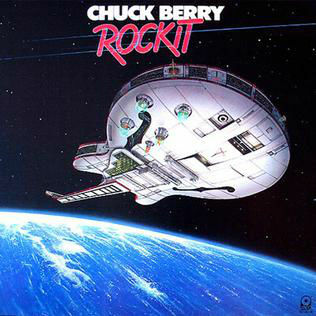 Rock It‘s cover art places it firmly in 1979: the image features Chuck Berry’s signature guitar in orbit far above the Earth, much like several Electric Light Orchestra album covers of the same vintage. No music has been released from the new album. Chuck Berry’s live performances in recent years (he last played live in 2014), as captured by cell phones held aloft by patrons in his nightclub, have mostly served as a reminder that he is an elderly man. But if he reaches for the quiet crooner reciting “I’m Through With Love” from Hail! Hail! Rock ‘n’ Roll (below), he may give us one of the greatest gifts he ever offered us in his long gift of a career in music: nonagenarian rock.